My mom shoots a look at me in the middle of dinner. I sit still, cease drumming my leg under the table, engage in conversation. Three minutes later, my knee is bouncing up and down again, making the whole table vibrate. I’m tapping my fingers against my thumbs, hands in my lap. I left the mountains a week ago to travel home for the holidays, and it has been months since I spent a night in the woods. My body jitters with excess energy that builds up in my quads and my shoulders. My sight feels dulled in the warm room, kept a balmy 62 degrees all day by the central air in my parent’s home. In the last year, I have grown into the mountains and trees and wide, open spaces, spending months on end outside every day and night, showers rare and beds rarer. In 2015, a week after graduating from high school, I drove up to Mt. Katahdin in Maine and hiked south for almost five months, until I had reached Springer Mountain in Georgia and thus completed the 2,189-mile Appalachian Trail (AT). The following April, after spending the winter working as a ski instructor by day and a waitress by night five to seven days a week in Colorado, I made my way down to a little town called Campo, on the border of Mexico and California. 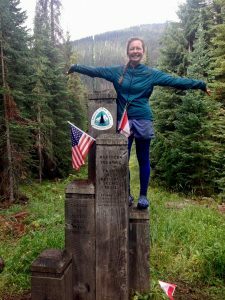 From there, I walked north to Canada, taking four months to hike the 2,650 miles of the Pacific Crest Trail (PCT). A day later, I was on a plane back to Boston, where I saw my parents for the first time in nine months and realized just how suffocating the suburbs can be. There is a forward momentum in thru hiking, not to mention a high daily dose of endorphins, that makes it satisfying in a way that creeps up on you. Even after a week of rain and long days, waking up and walking is inevitable. On trail, motion is imminent and unavoidable, making the transition back to a sedentary world jarring. For the past fall, I have been at college in Vermont’s Champlain Valley, where at least I can escape for daily trail runs or weekend hikes, but still I return to my dorm room most every night, to sleep surrounded by people, but far more alone than most nights on trail. When the nights grew cold in the late fall on the AT, my friend Goldielocks (long distance hikers frequently take “trail names”) and I would sleep curled up against each other, shivering in our thin bags. One of our friends might read a few pages of Catch 22 then we would take turns saying goodnight to someone in the group until everyone had been wished sweet dreams. On the PCT, my hiking partner Philly and I would pitch our tents close enough together that we could talk at a normal volume and hear each other from inside our own spaces. Once, while hiking in Washington with a group of four other thru hikers, after several days of rain forced us to eat dinner separately night after night, we all pitched our tents so close that some corner of everyone’s tent was overlapping with at least one, if not two, other tents. I ache for the freedom of a narrow pursuit: for forward, for onward, for outbound, for more. For even just a night, I want to feel the weight of the open air around me, only my nose poking out of my sleeping bag into the dark, nothing more than a half-inch of foam between me and the dirt. More than that, I want to walk, all day, until my hips ache and I’ve sweated out every anxiety and indecision into the wind, until I can’t shovel down my cold-soaked couscous quickly enough, and the earth rises up to cradle me as I melt down to meet it. A few days after heading back up into the mountains, my holiday obligations satisfied, my alarm goes off at six am. I can’t see as I stumble out of bed and wake up my friend Maddie, who has come up with me to a family friend’s cabin near the Green Mountains of Vermont in search of long days of hiking and maybe some powder stashes, though several weeks of sporadic temperatures make the latter unlikely. We take our time cooking breakfast and packing up, waiting for the sun to rise, then drive fifteen minutes through the one-street town of Granville and up into the mountains, climbing a snowy dirt road behind two logging trucks heading into the forest to work for the day. By the time we pull into the parking lot at the Clark Brook Trailhead, it is light enough to see, though gray clouds hang low on the mountain, and an icy drizzle slowly coats everything. It takes another ten minutes to pull on our boots, plaster our skins onto our skis, and throw some layers in our backpacks, then we’re off, climbing up the road to the trail past a couple sheds in various stages of abandon, our skis scraping over the snow, each stride making a sound like a knife being sharpened. In the 1930s, backcountry skiing was a booming sport, with races held on an international level and trails being cut all over New England. The equipment the skiers used resembled more the cross-country skis of today than any downhill ski. There were no metal edges or plastic boots or bindings, and parallel turns were just becoming mainstream. By the 1940s, enough chairlifts had been put in that the sport fell to the wayside, and cross-country skiing took over the exercise and solitude side of things, while alpine equipment got bulkier and stronger. Last year, Maddie and I invested in bindings and climbing skins that allow us to hike uphill on our solid alpine skis. Back in the 1930s, skins were made out of seal skin, but now they are a combination of nylon and mohair fibers that point toward the tail of the ski, allowing the ski to glide forward but not backward. Once at the top, skins can be quickly removed and stored in a backpack or jacket for the descent. Alpine trekking bindings come loose at the heel on the uphill, then click back down to allow normal alpine turns on the way down. In terms of price and weight, backcountry gear runs the gamut. Skiers can choose to prioritize the uphill or the downhill. Lighter gear, while faster, is not as good at charging down the mountain. The heavy bindings Maddie and I use are awkward on the uphill, but will take a beating on the way down, so we can ski hard on the resort and in the backcountry without worrying about our bindings not releasing properly. I lead the way, following the skin track as it climbs up toward the Long Trail (LT). Maddie is the youngest of four, with three older brothers, which perhaps explains why she is so comfortable following doggedly on my heels. Many of our adventures bring up stories of ice climbing with her dad, crashing off homemade ski jumps in her backyard in New Hampshire with her brothers, or running around with the donkeys and chickens in the backyard. A childhood of charging hard or being left behind has made her tough. We chat as we climb, trading stories of the outdoors. Talking about thru hiking calms the ever-bubbling emotions lingering from my hikes, and I can tell Maddie feels the same way about her past summers as a camper and leader at an adventure canoe camp in northern Ontario. She tells me about silent 2:00 am paddles under the stars and days of bushwhacking- cutting trail to lug the canoes through because the waterways on the map were dry. Though our excursions together have been only day trips so far, we bond in the shared time away from commitments and distractions. Maddie’s long canoe trips have instilled in her the same sense of forward momentum that the trail calls up in me. She even talks about coming to join me for a bit when I hike the LT, which is now only a mile away from us up the ridge, this summer. Most hikes in the Green Mountain region wind up intersecting with the LT at some point, making it the rugged encapsulation of the state both physically and figuratively. Completed in 1930, it is the oldest long-distance hiking trail in the country, and was partially the inspiration for the better-known AT. Indeed, the two overlap for 100 miles, before the AT splits off to head east to the White Mountains of New Hampshire and the LT continues north to the Canadian border, becoming progressively more difficult to hike. Construction of the trail commenced in 1910, one year after James P. Taylor, then the then Assistant Headmaster of Vermont Academy first envisioned it. Today, the Green Mountain Club, the same organization that formed to construct the trail on March 11, 1910, maintains the trail. The proximity to a long-distance trail with so much history was one of the things that drew me to the college I now attend. Somehow, just seeing one of the white blazes that mark both the AT and the LT transports me back to my own thru hike. Even in the winter, when running into another thru hiker is improbable, it assuages my antsiness to gaze down that narrow path. Though there will not be any views from the ridge, the desire to see the trail itself spurs me on, even as the skin track becomes harder to follow. As we climb, we strip off layer after layer, and I feel the constraints of the world of traffic and cell phones flake away. After a mile and a sketchy ice bridge river crossing, the skin track ends. Every few hundred yards I have to navigate over another rocky stream, making sure not to drag my skis on the rocks underfoot, and in between there are downed trees, some of which we awkwardly sidle under and others that we clamber over, skis still on. Even through these roadblocks, Maddie looks right out of a ski movie. Her straight blonde hair is pulled back in her ubiquitous ponytail and tucked beneath a wool beanie. She strides uphill with ease and precision, pausing when I fumble my way up ledges, then following with an efficiency of motion that makes me wonder why I was even struggling in the first place. As we get higher still, I am breaking trail through a foot or two of snow, stopping to jerk my skis through the crust or to side-step up rocky drops. The woods are silent as we ascend, into the clouds, the lightest mist coating our hair and thermal shirts. Only a little over 1,000 feet from the top of the ridge, the trail starts to climb straight up a rocky face. “So…” I hem and haw a bit. My stomach growls and my legs feel limp. “Looks pretty tricky.” I never want to be the one to admit defeat, the one to decide to turn around, as long as I am willing to keep moving, Maddie is always game. All our sentences drop off. My stomach growls again. I break the silence. “Let’s just turn around here.” The transition from skinning to skiing is still awkward for both of us, new as we are to the world of backcountry. Taking the skins off the bases of my skis seems to require either one more arm than I have or some strange juggling. The wet snow builds up under my bindings, so when I try to click them back down for the descent, there is ice filling in all the cracks and crevices where metal needs to go. 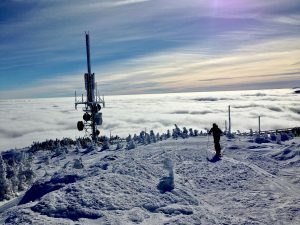 many ski areas are losing money or closing down. Maddie and I know that it will be difficult to find any good snow this winter, but for the moment, we simply relish the hike. Stumps and downed trees stick out everywhere around us, and the hiking trail itself is often visible right down to the rock and dirt. After attempting, to little avail, to pick our way down on our skis, we just strap them onto our backpacks and walk down in our ski boots. My sock is rubbing the skin on my heel raw, and my skis keep bouncing off the back of my head, but my lungs feel cleaned out by cold air and hard work. We don’t think about the demise of our winter obsession or the greater implications of global climate change. We laugh in the empty forest, and when we get home, both of us fall asleep on the couch before dinner, the nervous energy beaten out of my muscles for a night. A few weeks later, spirits bolstered by a few inches of snow mid-week, Maddie and I drive a little over an hour north to the tiny town of Underhill, Vermont, population 3,016. I steer my car, a burly SUV equipped with winter tires, up a mile of unplowed road to the base of the Teardrop Trail, a popular backcountry skiing destination. We gripe about the cloudy weather that casts a grim pall over the landscape but are still in good spirits when we head up toward the hills. The first part of the approach is flat, with a couple open water bars. Before long, we both have to pause to click up the risers under our bindings that make it easier to push off from a steep angle. By 10:20 am, we reach an old Civilian Conservation Corps (CCC) road that intersects with the Teardrop Trail about halfway up Mt. Mansfield as we head up, again, toward another section of the LT. The CCC road branches off to the left, flat and steady. In the quiet of the forest, only wooden signs marking the trail intersections, it is easy to imagine a group of men standing in this same spot in 1937, hauling tools in on the road they had built, cutting a trail straight up the mountain. The CCC was started in 1933 as part of Franklin Roosevelt’s New Deal, which sought to provide relief, recovery, and reform in response to the Great Depression. The CCC employed nearly 3 million men aged 17 to 28 until it was disbanded in 1942. It focused on conservation and development of the outdoors and natural resources. CCC men were paid $30 a month (about $547 in 2015 money), $25 of which they were required to send home to their families. They were fed, clothed, provided with medical care, and housed in camps, two of which were located in Underhill Center, the town closest to the Teardrop Trail. The CCC was one of the most popular programs in the New Deal and was expanded to include American Indians and veterans, as well as becoming 10% African American. Many trails around the nation today trace their roots back to the CCC. All CCC trails were uniformly and professionally built, so unlike many East Coast trails, they are often switchbacked, meaning hikers move up or downhill in a zigzagging pattern, rather than traveling straight from Point A to Point B, thus saving energy and making trails more accessible to pack animals or carts. Along the AT, which was completed as a continuous footpath in the same year that the Teardrop Trail was built, the CCC built the only switchbacked sections, including sections in the Shenandoah National Park and the Great Smoky Mountains National Park. When I hiked the AT, I remember marveling at the solidity of the stone walls upon which the trail was built in the Shenandoah (affectionately known as the Shennies) and delighting in the knowledge that I was hiking over history 90 years in the making. The Teardrop Trail, though easily accessed by the CCC road, which takes a more gradual, roundabout route from Mountain Road down below, does not make any pretense of switchbacking. It climbs right up to the Nose of Mt. Mansfield, rolling with the natural contours of the mountain. While we hike, I sometimes have to skin back and forth from one side of the trail to the other when it gets too steep to go straight up or follow the skin track someone else laid out a day or two before as it meanders off into the trees. 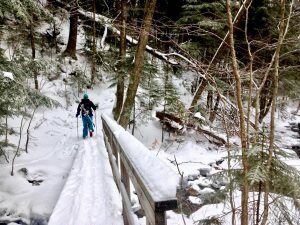 Charlie Lord, the master engineer for all the trails in the Stowe network, designed the Teardrop Trail, the first trail on the backside of Stowe, much closer to the Burlington area than the frontside. He was an avid skier himself and designed the trail to be fun to ski. Skiing was, and remains, a middle and upper class sport, so most of the men who worked to build the trail would never ski it themselves, although many gathered to watch races on the trails they had built all over New England. The Teardrop Trail climbs about 2,000 feet over the course of 1.8 miles and was named by Perry Merrill, a Vermont State forester and avid skier, because the ski down was so quick that it “made tears run from your eyes.” The northern and western exposures on Teardrop ensure that it holds snow far longer than some of the other backcountry trails off Mansfield that are more easily accessed from the lifts, making it a reliable powder stash that only those willing to work for it can ski. About three-quarters of the way up, the skin track that we are following peels off into the woods, leaving untracked pillows of snow all the way to the top. The closer we get to the summit, the more the wind has built up the snow into deep, soft drifts. The clouds have hung in the air around us for most of the climb, but all of a sudden I come around a corner and see, straight ahead, the sparkling peak of the Nose, the middle peak of Mansfield, dotted with scrubby trees and covered in rimy snow and ice. The sky is an unblemished blue, but below us, a sea of clouds rolls out, leaving only the highest peaks exposed above an impenetrable layer of white. A warm front has moved in above the cold air, creating a temperature inversion. Inversions are most likely when there are long nights, calm winds, and clear skies, like the night before, all of which allow for a prolonged cooling of air near the ground. The cooler the air is, the less water vapor it can hold, so clouds appear in the cooler air in the morning, while the higher, warmer air is drier. Effectively, the warm air creates a cap that traps all that moisture below a certain elevation, in this case somewhere around 3,500 feet above sea level. Our vocabularies are reduced to those of your typical 12-year-old as we realize we have risen above the clouds. “Crazy!” We giggle and whoop and dance as we climb. Eventually, after awkwardly duck-walking up some banks of powder and pushing through lots of ankle-deep snow, we reach a sign telling us that we are on the LT. I feel that bubble of excitement well up in my stomach, knowing that I could pick a direction and walk either to Canada or Massachusetts and continue on from there to Georgia or even Florida. From the junction, we can see some radio towers poking up through the trees just a few yards away. After another ten minutes of meandering through the woods, sunlight piercing through the trees and sparkling off the snow, I realize that the radio towers must be much bigger than I thought, because we have only just reached the toll road, and need to follow it around and up a ways more to a peak that had not been visible before. Only krumholtz, the tiny, stunted trees that survive in alpine zones, grow in the last couple hundred feet of elevation gain. Krumholtz grow in the transition zone, or ecotone, of artic tundra, a biome surviving from the Ice Ages, and subalpine forest. Since artic tundra only remains in three places in Vermont, it is a rare sight in the Green Mountain State. The ground is covered in rime ice and wind-swept snow that feels like Styrofoam to walk over. Everything is brilliant, ice throwing sunlight into the air with abandon. Maddie, who is naturally reserved in word and expression, brims with enthusiasm at the sight of the clouds spreading out below us. A local from Stowe reaches the peak just after us, having hiked up from the quad, and points out all the summits that poke up into the sunlight. To the east, we can see Mt. Washington and the other mountains in the Presidential range sprawled out along the horizon. In the opposite direction, several Adirondack peaks flank Mt. Marcy, while Smuggler’s Notch is visible just over the way, and Camel’s Hump and Mt. Lincoln are strung out to the south. The clouds hide the valleys of human life from sight, the only signs of development the ski trails and chairlifts poking out below. Somehow, even though the wind is blowing, we are warm in the sun. After half an hour of peering at far-off peaks, we are ready to turn around. The first section of the ski down is along the LT. The trees hem us in, but the snow is deep, which slows down my descent some. Still, by the second pitch I am flying down the trail, dodging branches that pop up in my face and barely holding on as I steer my skis through the narrow line between the trees. When it finally spits us out onto the open ski trail, my heart is pumping with adrenaline. From there, we cruise down the Teardrop Trail as it rolls with the mountain. The whole ski down is mellow, but the combination of steeper and gentler slopes allow us to pick up some speed, dumping us down unexpectedly only to flatten out a bit or buckle into little roll-overs that we bounce off of. I can see why Charlie Lord thought this path would be fun to ski; there is always a new twist around the corner, and even though I skinned up it only an hour before, I cannot remember every turn. The snow is soft and relatively untracked until we reach the CCC road, where more people seem to have skinned up to and turned around. As we get closer to the car, the cover gets thinner and we are forced to pay attention to the rocks and stumps poking through the snow. All in all, the time we spend on the uphill in the backcountry is far greater than that spent sailing down, but the adrenaline of the speed and the fluidity of a series of turns leaves us glowing long after we have driven back out to the paved, snowless roads of the valley. Both of us forget to pay attention to where we are going on the way back to school and we get way off track as a result, missing a crucial turn and driving almost all the way to Burlington before realizing our mistake and heading south again. So far most of our skins together have felt like slogs, fun hiking, but with little to no reward. Mansfield has redeemed the sport of East Coast winter hiking and given us back our vigor. 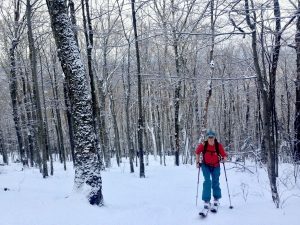 A few days later, we are back in the backcountry glades near Brandon Gap, also along the LT, that an organization called Randolph/Rochester Area Sports Trail Alliance (RASTA) has recently cut. We have skied here once before, early in January, when the existing snow base was covered in a three inch thick ice crust that grabbed our skis and refused to let us turn smoothly. We are hoping that the snow we have received in the past week has been enough to make for some easier turning. In the hunt for untracked powder, many locals are protective of their backcountry stashes, revealing the location of their favorite turns only to the closest family and friends. RASTA is contradicting this mentality by legally cutting and marking backcountry trails on public land and publishing maps to the areas online in an effort to create a mecca for backcountry skiing. As we pull into the parking lot, a handful of skiers are gathering by the trailhead. We chat with them and, in the circuitous fashion typical of outdoorspeople hesitant to brag about their accomplishments, figure out that they are RASTA members involved with trail building. A couple people from Vermont PBS are waiting in the bushes down the trail, jogging around on their snowshoes with clunky camera sets. Apparently, they are doing a story on the RASTA trails and are out today to get some film. It does not take long to pull ahead of the RASTA guys and their crew, but the further we climb through open birches and dense firs, the more apparent it becomes that the snow underfoot is yet again covered in a layer of hardpack and ice. The ski down is a little better than the last time we were at Brandon, but bringing my skis around still requires abrupt effort and force with each turn, rather than the gradual pressure and rotation it would entail in softer snow. We have the woods almost entirely to ourselves until, about halfway down, we run into the RASTA crew again. They are all waiting at the top of a pitch while the film crew sets up below to capture the action. We cannot get by until they have moved, so we just sit back and watch. One by one they hop-turn their way down, chopping through the crust with the edges of their skis then leaping into the air to land the opposite direction. Their athleticism is apparent, but even seasoned skiers could not make these conditions look good. When they have all made it past the cameras, the woman filming closest to the top calls up to us and invites us to ski down as well. Maddie and I shrug to each other, then proceed past both cameras, awkwardly hop-turning and trying not to get stuck in the bushes or careen into one of the PBS people. When we get down, the woman who waved us on asks to interview me for the show. “How was the skiing today?” She earnestly inquires. “Horrible!” I reply brightly. “There’s about three-quarters of an inch of ice crust on top of the snow that makes for some pretty terrible skiing, but hopefully it’ll snow more soon and then it’ll just make for a solid base.” The RASTA skiers think my answer is accurate and hilarious. “You can’t use the video of us skiing today,” they laugh, “No one is going to want to come backcountry skiing after they see us struggling through that.” We are all grinning ear to ear. Awful conditions are just part and parcel of being an East Coast skier. To to be a true New Englander, one must be prepared to complain liberally and frequently, but still tromp around and have a grand, old time in spite of inconveniences like blizzards or freezing rain storms or unexpected deficits of snow. In some ways New England outdoors communities resemble the thru hiking community. Thru hikers and New Englanders, alike, march dutifully through rain, sleet, and bruised toes in pursuit of “the outdoors”. The outside world thinks us antisocial or cold, but we share amply and willingly with close neighbors. We are in it for the long haul, dedicated to the forest and mountains for a lifetime, undeterred by days or even weeks of less-than-optimal conditions. When all comes to a close, we have little more to show for our efforts than achy knees and tight-lipped, full-hearted friendships. Maybe it will snow this year, maybe we will have another drought like last year, but either way, if you venture into the woods at the right hour, you will be sure to hear the frenzied laughter of native-born New Englanders as we flee the realm of man.